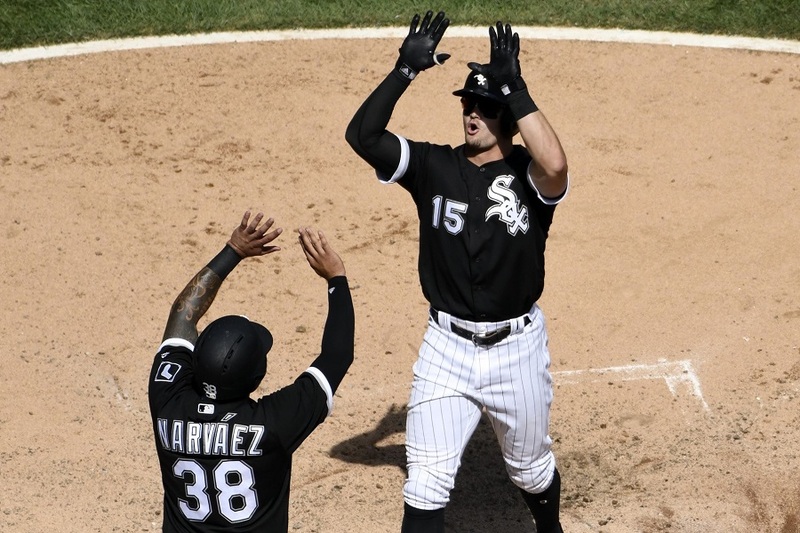 Kyle Gibson has been a steady performer this season, but Wednesday afternoon in Chicago the White Sox knocked him around a bit. Gibson failed to complete five innings for the first time since April 11 and just the third time overall this season in 26 starts. He also gave up three home runs for the first time all season. It was just the fourth time he’d given up multiple homers in the same game all season. To make matters worse for Gibby, Logan Forsythe committed an error that eventually led to three unearned runs. On a positive note, Forsythe had another good day at the plate, going 3-for-5. 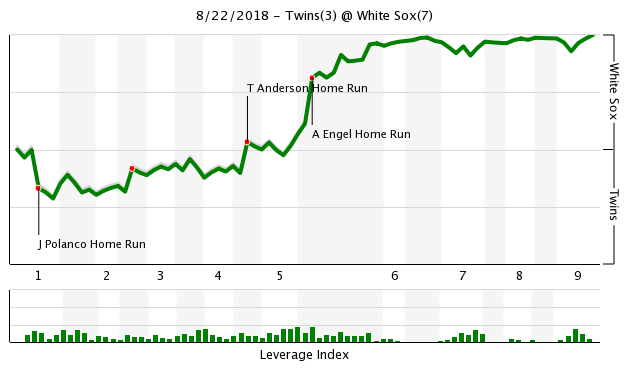 The Twins actually had a 2-0 lead before they even took the field thanks to a Jorge Polanco two-run homer, but couldn’t get much else going at the plate from there. Gabriel Moya took over for Gibson with two runners on and two down in the fifth. He walked the first batter he faced to load the bases, but then induced an inning-ending pop out. Matt Magill pitched a scoreless sixth inning. In the seventh, Addison Reed pitched his first 1-2-3 inning since June 6. In the 18 appearances he made between then and now, he surrendered 17 runs (15 earned) on 30 hits, four walks and a hit by pitch over 18 innings of work. On the downside, Reed still only topped out at 90.2 mph. To finish a positive day for the pen, Oliver Drake pitched a 1-2-3 eighth. He’s given up just one hit over 9 1/3 scoreless innings of work so far with the Twins. There were a lot of strange base running plays in the this series, but this one has to take the cake. I really root for Garver, but I have a hard time understanding how he can be so mentally absent at this point. First the bunt play, and now this rundown that became a movie to watch for him. Hard to believe, but you can watch it over and over to try to get it. It's not helping. The base-running was awful! Why are the Twins so poorly coached that their players don't know what to do? I think our problem is that we are homers - we think our team is better than it really is.We are five games below 500 but we have played the Orioles and are 6 - 1, the Tigers where we are 7-6, the White Sox 9 - 6, and KC 6 - 6. We are 28 - 19 against these terrible teams.I will let you do the math with the rest.http://www.espn.com/...tandings/grid��Our team has one player challenging 300. I know we like our team, but we stink.Today we messed up in the field, on the mound and at bat.It is who we are.We rank 10th in pitching in the AL, 8th in hitting, and 8th in fielding.We are 12 in homeruns, 11 in slugging.How do we expect anything more than where we are? we can pretend that we have some real talent, but nothing really stands out.Blame Molitor if you want, but that is not going to make a difference.Blame the FO - they give us the roster. Did the pitcher cover home plate on the muffed rundown? If not, Garver did the correct thing by holding the baseball at 3rd base. OK I watched it again and the pitcher was where he was supposed to be. Garver goofed up. I think our problem is that we are homers - we think our team is better than it really is. We are five games below 500 but we have played the Orioles and are 6 - 1, the Tigers where we are 7-6, the White Sox 9 - 6, and KC 6 - 6. We are 28 - 19 against these terrible teams. I will let you do the math with the rest. http://www.espn.com/...tandings/grid Our team has one player challenging 300. I know we like our team, but we stink. Today we messed up in the field, on the mound and at bat. It is who we are. We rank 10th in pitching in the AL, 8th in hitting, and 8th in fielding. We are 12 in homeruns, 11 in slugging. How do we expect anything more than where we are? we can pretend that we have some real talent, but nothing really stands out. Blame Molitor if you want, but that is not going to make a difference. Blame the FO - they give us the roster. Mental errors are on the player first, coaching second. It takes no minimum level of skill to properly execute a play. The physical aspects of the game most assuredly rely on talent, but the mental part of the has no bearing on how talented a player is. So to say that these mental errors are on the FO is misguided. That's what coaches are for. Can we keep Berrios and just get rid of everyone else? I have no hope for anyone else on the roster. Even Rosario doesn't give you a good at bat everytime up. Let's blame Molitor and the FO for not doing their jobs but most of the problem is that these players just simply stink. Believe me, I get your frustration and feel it myself! And who knows, maybe we are homers, but I am still going to have to disagree with you on some points. I get what the numbers say. They are a reality. And this not a bash Molitor/coaching/FO comment, but I do disagree on the talent aspect available to quite some degree. I am NOT saying the performance is there, but the TALENT of Rosario, Buxton (I know he's not here right now), Kepler, Sano and Polanco is a really good place to start, position wise. Garver is debatable, but I like the bat, and how it can play, and I still think he's made overall improvement. 1B, 2B and DH (Though I don't buy in to necessarily having a big bopper DH with a nicely balanced roster). I like Rosario and Gibson, as well as the potential of some of the kids and a positive return for Pineda, which is looking more and more positive for 2019 with each appearance. I like some of the bullpen arms, but Reed is a question mark and more work is needed there. This roster is by no means anywhere close to a completed project. And this off season is where the FO really earns their stripes, IMO. But again, poor performance, doesn't always equate to available talent. Especially considering how this season has gone, recent trades, and now auditioning players for 2019. Stewart, Odorizzi and Gonsalves next 3 games? Over/under for total IP between the 3. 13.5 is the number. Go. Garver... I've been asking for his playing time. I'm getting it and I guess I gotta take what comes with that. Wow... It's like his brain just went to sleep. I'm not angry... It made me laugh. True, it's on the players first and foremost, but I would put the coaches third. It's inevitable that you'll see mental mistakes and half effort when a team is out of the race. Expect the follies to continue though it would be hard to beat a couple of the plays we saw this week. Tim Lincecum made a similar play/nonplay in the first inning of the first game of the 2010 World Series, running a guy back to third base without making a throw. Really, you can only watch in disbelief. Like I used to tell the kids I coached, "Its OK. It gives me something to tease you about til you die." They've been happening all season though. They've been a sizable contributing factor to why they are where they are. It's also been a problem for Molitor led teams for most of the time that he's been at the helm. It's not just this season. Molitor exudes passivity on the bench. Will anyone be held accountable for a play like that? Or does he cerebralize it all away? This doesn't really mean that much. Yankees, Red Sox, Astros, Indians and A's don't win 60% of their games because they have winning records against each other.Twins are 3-4 against Boston, 8-8 against the Indians, 2-1 against the Astros and 3-1 against St. Louis. IMO, the Twins started the year with way more talent than they had last year. They still have to perform. Maybe next year they put it together.Maybe the year after that.Some fans say wait til next year as some kind of dismaland futile battle cry. (cry being the key word).I say wait til next year and look forward to it.Yeah, I'ma homer. Doesn't mean I am unrealistic.I consider myself an optimistic realist.This team could have been way better if the players had played better. I don't think the talent was so low that they were incapable of playing better. Hrbek, Gaetti, Puckett and Gagne went through some pretty rotten years. Stewart 4.Odorizzi 4.Gonsalves 5.2. Over.Its a fair over/under.I would probably put $10 on the over in Vegas.Oakland has a pretty good offense even though they don't have anyone challenging .300 either.Not even close. Who hires the coaches?We just are not sharp as an organization, despite our talent, the way we were when Kelly and then the first years of Gardy made the Twins Way a mark of excellence.Even without talent to be a superstar, there should be an automatic - not mental - response to situations. One question that arises in my mind over the Garver play and I cannot answer it.Did Garver perceive that if he threw to second the runner from third would score.I do not have a mental image of where the other players were - who would cover second and who would cover home? I'd be uneasy about a throw to second followed by a throw home, but you have to be willing to make the right play. Maybe a throw to Polanco now covering third was indicated, sooner, but there was a lot of traffic around the bag and a throw could easily have gone haywire. After his throw, where should Sano be? He was backing his way up to the bag, unaware that Polanco was there. He was part of the clutter that maybe caused Garver to hold off and just chase the runner back. The umpire and (especially?) the base coach also were contributing to the clutter. The rule about coaches staying in their box is always ignored. In this case maybe you can see a reason for the rule. I don't think there were two men on third by the time Garver reached the base. No one to tag out. From what I saw, all bases were covered properly. The pitcher covered home like he was supposed to and somebody, I assume the 2B, was covering second. My first reaction was that perhaps home wasn't covered, so he ate the ball so the runner couldn't score but Magill covered it properly.